An 8-bit pin converter is a small attachment placed between a Famicom or NES cartridge and the console. It either adds pins or takes them away. For a Famicom owner, a 72 to 60 pin converter will convert the 72 pins of an NES game to 60 pins so that the NES game can be played on the Famicom. For an NES owner, a 60 to 72 pin converter will convert the 60 pins of a Famicom game to 72 pins so that the Famicom game can be played on the NES. While Nintendo never really sanctioned their use, with the exception of the one pin converter to the right found in some NES cartridges, pirate companies that sought to expand their video game market beyond one console created many converters. A pin converter -- where beginners begin. The T89 72-60 Pins Cartridge Converter, sometimes labeled "Spica," is perhaps the best quality converter you can find without having to pay a fortune. The crappy thing about this particular converter is that it was made specifically for use with the SY-700 Famiclone, which means you can't use it with another system -- sort of. Packed in a dark turquoise case and having a red, white and blue ribbon, the Nintendo Power cartridge converter is perfectly marketed for the States. There is nothing special about the NASA Games Super Adaptor. NASA Game's version seems to be one of the more common of the name brand converters. The HoneyBee Family Adaptor converts your Famicom games for play on your NES. It doesn't need a ribbon to pull it out of your NES and might be the only converter ever made like it. HoneyBee converters manufactured for NES-to-Famicom conversion were either gold or gray. Both colors do the same thing, but who wouldn't rather have a gold one? This gold HoneyBee is 60 to 72 pins, meaning you can play your Famicom games on your NES. A converter like this is a great place to start Famicom gaming. 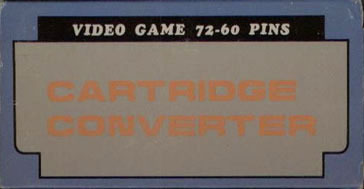 It's gray, it's small, it's labeled "Game Converter," and it has a light blue ribbon attached to it; there's really nothing more generic than that. The only thing remotely unusual about the Game Converter is that it comes in a nice, durable black casing...even the ribbon is black. Otherwise, it's what you'd expect. The Konami Q Famicom Adaptor is an accessory converter that allows gamers to play special cartridges. Why the adaptor and its games were manufactured remains a mystery.